Jupiter will command attention for months to come, but two other gas giants that are now coming into prime viewing should not be ignored. 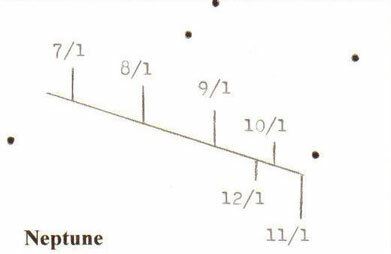 Uranus and Neptune may seem small, dim, uninteresting, and too challenging to bother finding, but all that is required are the finder charts that accompany this article and a clear, moonless night, preferably away from city lights. Uranus spends all of 2007 in Aquarius while Neptune is in Capricornus. Neptune is at opposition on August 13 at magnitude +7.8. Uranus is at opposition on September 9 at magnitude +5.7. Rising at sunset and setting at sunrise, both worlds will be up all night on these dates. They will remain in the evening sky for the rest of the year until they are lost in the evening twilight during January 2008. 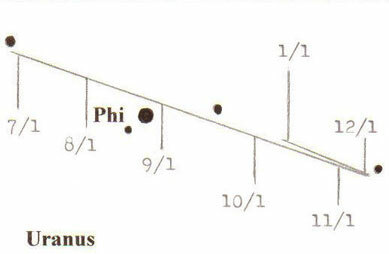 Uranus can be found west of the 3rd magnitude star Phi Aquarii. 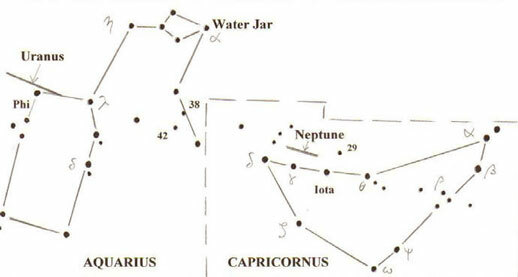 Neptune can be found above and between Gamma and Iota Capricorni. A small telescope is capable of resolving the discs and revealing the colors of these remote worlds given a night of steady seeing. The planets appear distinctly different with Uranus having a rich turquoise hue while Neptune is a chilly icy-blue disc. Uranus is 3.7 arcseconds across and 1.77 billion miles away at it closest point this year. Neptune is 2.4 arcseconds across and 2.70 billion miles away. Both planets are too far away to observe cloud detail or their moons unless the telescope is at least 16 inches. The MVAS Apollo Observatory houses a 16-inch Schmidt-Cassegrain telescope and its clean, new optics in the relatively dark country sky has already given Uranus and Neptune distinct personalities. Uranus appears as a true turquoise globe instead of a tiny disc and two moons, Oberon and Titania, can occasionally be seen within its glare. The other three rather large moons of Uranus; Umbriel, Ariel, and Miranda are more difficult to see and all five moons shine dimmer than Pluto at magnitude +14 to +15. Neptune appears like a tiny bluish globe with magnitude +13.5 Triton shining dimly nearby. There are several fun projects for each planet, which include photographing each on every clear night possible to determine if there is a fluctuation in brightness. This could reveal evidence of bright clouds or dark spots. Neptune is notorious for rapidly changing cloud belts and spots and now Uranus has been growing active as sunlight shines more directly over its equator. No actual cloud detail can be seen, or can it? Recent amateur photography has improved to the point where some large features, such as a bright polar hood on Uranus, have been photographed. A magnification of at least 500x for Uranus and 900x for Neptune along with a yellow-green (Wratten #11) filter are required in order to have a chance at photographing any detail. Uranus and Neptune do not reveal the riot of detail that Jupiter displays nor do they have vivid, icy white rings like Saturn, but both have their own enchanting qualities. Their featureless, bluish globes among the countless, white pinprick stars on a balmy summer night are soothing to the soul.